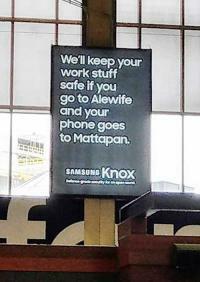 Two Samsung advertisements were taken down from South Station last week after local officials said the message played into offensive racial stereotypes about the neighborhood of Mattapan. The company has since apologized. "We'll keep your work stuff safe if you go to Alewife and your phone goes to Mattapan," the ad read in bold white font against a black background. The advertisements, intended to publicize a technology feature, Knox, were removed Thursday after being put up earlier that week, but not before sparking outrage in the community. The Bay State Banner posted a photo of the ad on social media. Criticism was swift from elected officials and residents alike. State Rep. Dan Cullinane, who represents portions of Dorchester and Mattapan, asked for Samsung to remove the “inappropriate and offensive” advertisement in an email he sent to the company late Wednesday night. "Samsung will have the position that someone who doesn't know the area came up with the ad and that they were looking at stations at either end of the MBTA map,” her wrote in the email, also posted on his Facebook page. “This is flawed for many reasons especially because you can't hide behind someone leaving their phone on the train because to get to Mattapan you have to board a separate trolley vehicle so this line of advertising thinking makes no sense," Cullinane wrote. Cullinane said Thursday night that he had received no direct response from Samsung, though the company released a statement earlier that day. “While our advertisement was meant to showcase KNOX’s capabilities when someone forgets their phone on the train, as soon as we were made aware of the reaction to our South Station placement, we worked with Clear Channel to take the sign down immediately,” a spokeswoman said in a statement Thursday. “We sincerely apologize to the people of Mattapan,” she said. Elected officials and other community leaders said Samsung’s ad was, at best, a clumsy attempt to highlight the product’s security features. At worst, it inadvertently implied that residents of Mattapan, predominantly a community of color, would steal phones. “I know a lot of people who were alarmed and offended,” Cullinane said, adding that his office received multiple calls about the ads. Ashkenazy Acquisition, a New York developer of retail properties, manages South Station. “Clear Channel, Ashkenazy's ad contractor, removed the ad. The MBTA was not aware of the ad before it went up,” an MBTA spokeswoman wrote in an email Friday. According to the mayor’s office, the state Department of Transportation informed Mayor Martin Walsh that the signs would be removed immediately. “These advertisements have no place in Boston,” Walsh said in a statement Friday. City Councillor Tito Jackson, who is seeking the mayoral seat, posted on his Facebook page that he had spoken to the MBTA Thursday afternoon after seeing the Banner post and was told that arrangements were being made to take the larger sign down. “I have also received reassurance that there would be an examination of the screening of future ad content,” Jackson wrote. The controversy around this advertisement should serve as a lesson for more sensitive marketing, others said.“This sort of campaign is disrespectful to Mattapan and plays into stereotypes that were never 'fair' to begin with,” state Sen. Linda Dorcena Forry wrote in a statement Thursday. “I look forward to meeting with Samsung's executive team to make sure it doesn't happen again. Also, I want to discuss how Samsung can be constructive by supporting initiatives in Mattapan,” Forry said.